TruGreen is the best you can get your hands on when it comes to a reliable landscaping service. They’ve been doing business for for more than thirty five years, and they know just about everything there is to know about grass seed, soil fertilizer, and proper lawn care. They use only the best equipment and top grade fertilizer on all their customers’ lawns, and they can make even the brownest lawn come back to vibrant, green life with the proper lawn care procedures. They offer the fairest prices you’ll ever find on all of their service options, and you won’t have to worry about your lawn ever again if you go with one of their affordable service plans. TruGreen started in Lansing, Michigan, in 1973. They are a division of ServiceMaster, headquartered in Memphis, Tennessee. They are officially the biggest lawn care service provider in the United States. All employees are well trained in the science of lawn care before servicing customers in their region. This ensures consistent quality in every sector they provide service to. They have maintained excellent relations with their customer base over the years, and they are constantly expanding. TruGreen offers many generous discounts to both new and loyal customers, and your end of year savings will surprise you. They will help you to maintain a proper ph balance in your yard’s soil conducive to growth, enabling you to grow whatever you want throughout the entire growing season. Are you thinking of creating a garden, or expanding your current garden with new hybrid seeds? TruGreen will prepare your soil to the right consistency for rapid plant growth, and will eliminate weeds and other garden and lawn pests. Mild insecticides will help your lawn to thrive. TruGreen knows all about pesticides. They’ve been using them for years. The chemicals TruGreen uses to treat your property will do no harm, while effectively keeping problem bugs out. Clearly the biggest name in landscaping and lawn care, TruGreen will keep your shrubs cut back and your lawn at the proper length. Choose from among a variety of options, including weekly or biweekly mowing, and occasional trimming and pruning of dead and overhanging branches. Fall season can produce huge chores for homeowners and businesses. TruGreen makes it simple. They will mulch your fallen leaves, branches, and other debris, recycling it for the benefit of the planet. When there’s a lot of moisture in the air, it can cause unwanted side effects that make mowing your lawn difficult. A lot of homeowners have complained that the water in the grass and soil causes their mower to clog. TruGreen uses mowers with an adjustable blade for the perfect cut no matter what the conditions. Fertilizer is very important. Without this important ingredient, your soil may not have the necessary nutrients to grow a full, healthy, and green lawn. It contains organic compounds that the soil needs in order to supply essential nutrients to your grass seed. TruGreen will apply a generous treatment of fertilizer and water, in addition to the regular mowing schedule, if you prefer. With over thirty five years of experience backing them up, TruGreen is the cream of the crop when it comes to your choice of landscaping companies. No matter what hybrid of grass seed your lawn is composed of, or the frequency with which you water it, there will be a need to regularly trim and maintain it. TruGreen listens to its customers, and if you have any specific requests, they will be glad to accommodate you as much as possible. If there is a particular lawn treatment you want or brand of chemical additive you want used on your lawn, let them know. With TruGreen, you will get all the services you’d expect from a professional landscaping company without getting hassled or ripped off. You get to choose the frequency with which you elicit their services, and what those services will include. 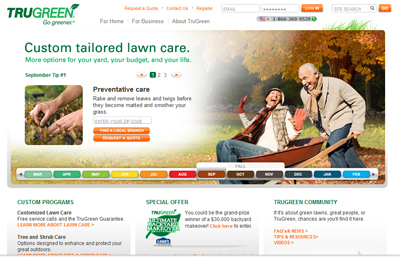 For a more comprehensive overview of what this company can do for you, visit TruGreen.com. Many who have never before bothered to look into having someone else take care of their outdoor chores have been surprised to find how cheap these services are. For example, the basic lawn care maintenance package costs less than sixty dollars per application. That’s a huge savings of both time and money when you consider the amount of money spent on gasoline for your mower and the cost to maintain it, and the hours every week weeding, feeding, and mowing your lawn. Sure, you could have one of the neighbor kids do it, but if you want consistent work and a professional, finished look, look no further than TruGreen. A lot goes into building a new lawn from scratch, and if you’re one of those homeowners who has spent hundreds on a carefully applied system of sod and grass seed or grass plugs, you will want to protect your investment with a vengeance. Too much sun and not enough rain can damage you grass severely. If this has already happened to you, it’s not too late. You can revive your lawn with an application of fertilizer and systematic regular maintenance from TruGreen. For those who will be away from their home for the summer, there are service packages offered at a discount for seasonal service, as opposed to the full price for service year round. Become one of the millions of satisfied customers who have discovered what a difference TruGreen can make for getting a perfectly manicured lawn every time. Go to www.trugreen.com and enter your zip code for a free quote on one of the many lawn maintenance plans for your yard, or give them a call. Their staff are friendly and knowledgeable, and will answer any questions you may have. To renew your service with them, check out their renewal page, or click on an option for automatic renewal at the start of the new growing season. For a detailed yard with the professional touch, TruGreen beats out the competition. Do NOT hire this company! I paid for one year service under any conditions. My lawn was in the worst condition ever while I paid them to care for it. after I told them to stay off my lawn they returned the following year while I was not home sprayed and sent me a bill. They were totally unwilling to resolve the matter for me. Since hiring a different service my lawn has returned to perfect. I wrote a blog about my experience with TruGreen at http://prudentinvestor.wordpress.com/2013/09/13/trugreen/. How can they still be in business? Sorry you had such a bad time with TruGreen, but very thankful to you for saving me that aggravation, George L. Smyth! What lawn care service did you hire after them, that you like now? Sorry to see the negative comments. We live in a small town, a quite a few residents use TruGreen. Our yard has been in such need of repair, because of the creeping charlie, Jenny, or whatever you wish to call it. Plus all the other weeds we couldn’t get rid of. After the 1st visit you could see such a change! No weeds, except for vine. Our grass has been improving like crazy. The creeping vine is fading in most of the yard. It is, as you know a very hard plant to get rid of, almost impossible. TruGreen just did their 2nd time out last week. They targeted vine, it is starting to die, hooray! The technician is very polite, plus he does not start job until he has knocked on the door to speak to us. As I said earlier, I’m sorry to see the negative reviews. True we’ve only spoken to them four times, but so far they are very much worth the money.